I bought the car without a title. In Colorado, a non-titled vehicle requires an official State Patrol vin inspection. Everything needed to drive on the street has to work, otherwise you're stuck with a "salvage" title. Getting the electrical part sorted out was a priority... and a major headache. I'm pretty good with electrical problems but this car was a nightmare. 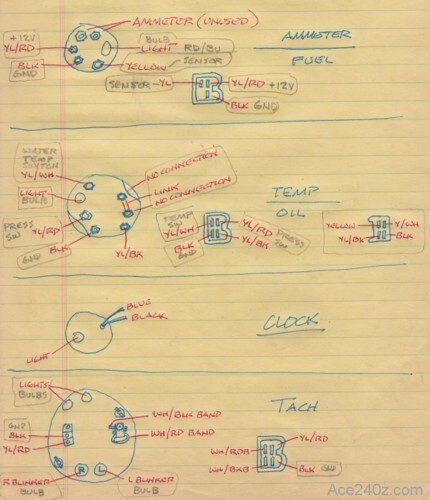 Wiring diagrams back then were hand-drawn with ink on vellum, and not easily updated. Online I found diagrams but not all of the colors matched mine. Was it a '70, or a '71, or a California model? I traced things back and forth. I poked and prodded. One moment the headlights were dark but the horn worked, or the headlights worked but not the flashers, and so on. It drove me nuts. I ended up tearing everything out and started from scratch, which turned out to be the right choice because behind the dash was a failed splice that created the intermittant problem. Instead of copying the original Datsun design, I upgraded it to meet modern standards. I'm a drafter-designer by trade, so creating a diagram to match was easy. To get everything to work, I had to reverse-engineer the switches, the lights, the gauges, and so on, and match the stock colors up with the new colors. I bought original-style connectors, bulb sockets, relays, and lots of wire. 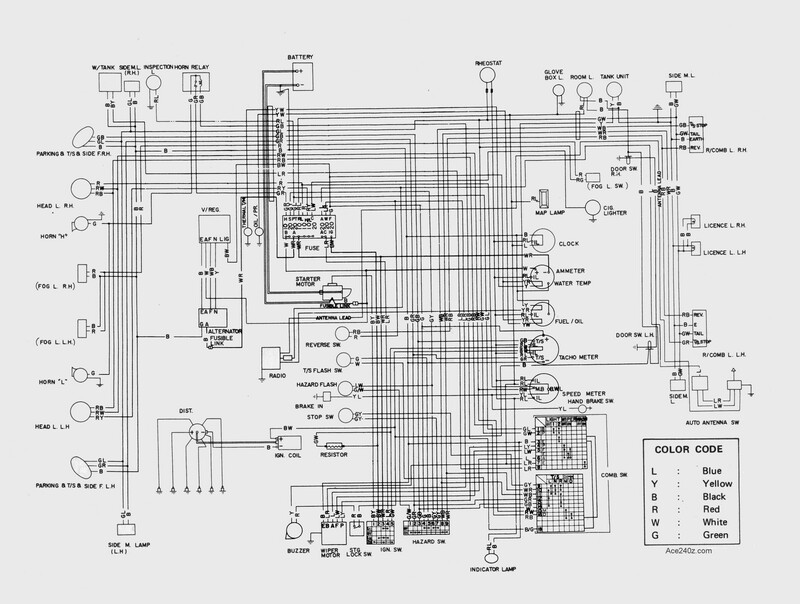 It took more time than I'd feared, but now everything works perfectly and the diagram is far better than Nissan ever dreamed. 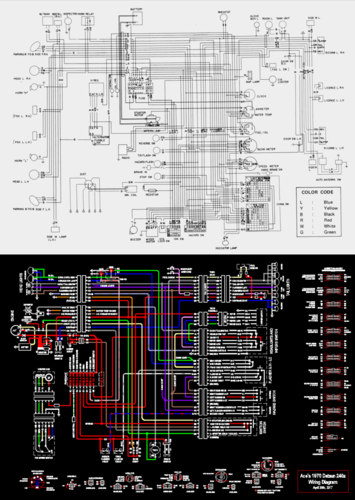 Click on the upper image to see their diagram, or click on the lower image for a PDF of mine. Here's sketch I made of the gauges. Armed with a test light and a fair amount of patience, I figured out how each one worked. I did the same thing with the headlight switch, wipers, turn signals, and everything else. I even puzzled out the heater switch connections - something Nissan never showed on their diagrams. The existing wires were crimped into OEM-style connectors with the new wires on the other side. Worked pretty slick. If you're looking for connectors, the absolutely best place I've found is Oregon Motorcycle Parts. They specialize in OEM connectors for vintage Japanese motorcycles, which happen to be a perfect match for a 240z. 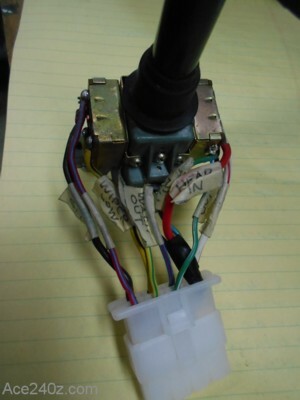 Here's how the modified headlight-wiper switch. Each of the wires was labelled, then attached to the new connector. Hopefully I'll never have to remove the switch, but I'm ready if I do. I took apart the mechanism and cleaned the corroded contacts. 46 years had taken a toll. Now there's no more overheating because all the switch does is turn a little relay on or off. The relay itself takes power from the new fuse block and sends it directly to the headlights. The wires are large enough that I can upgrade to more powerful lights in the future. I did the same modifications with the turn indicator and ignition switches. All nice and clean. For the most part, the electrical portion of this project is done. Whew.